Our smiles are very important to us. They can make or break a first impression. At West Gate Dental, we want to make sure every first impression and every smile is a positive, confident experience. With a tooth missing, it can be hard to be fully comfortable with your smile, and our office wants to change that. Our family dentist provides dental implants to correct a missing tooth. Patients may have a missing tooth due to multiple reasons including injury, decay, gum disease, infection, or possibly because they were born without a tooth. Together, we want to make sure you feel confident and comfortable with every smile, and a dental implant can get you there! 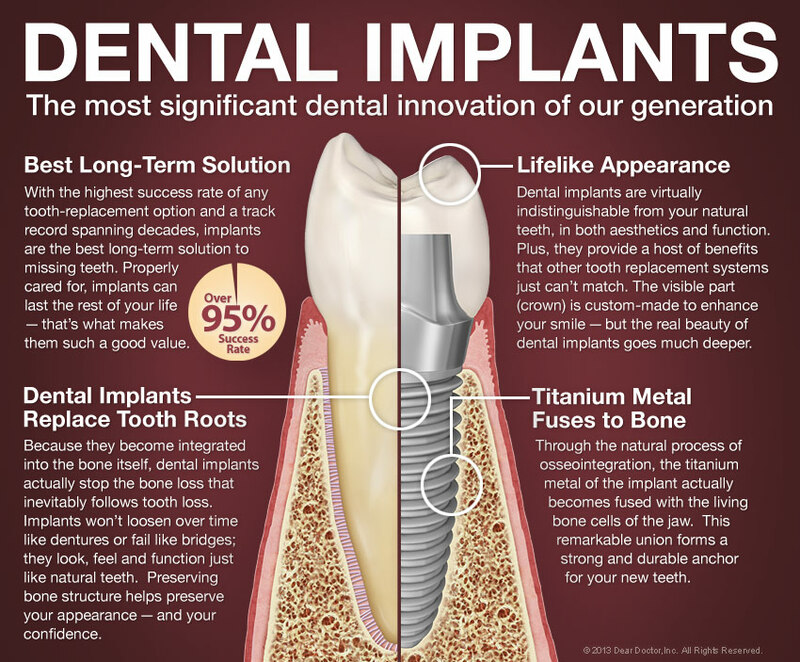 At our Lincoln, Nebraska office, we want to answer all of your questions about implants and in turn, give you all the necessary information to make the best decision for your smile. Dental implants are small titanium posts that replace the roots of missing teeth (View Example). They are inserted into your jawbone during a minor surgical procedure that takes place in our Lincoln, Nebraska office. After the implant has been placed in your jawbone, a lifelike porcelain tooth crown is attached. In most cases, the implant needs to fuse with the bone for several months before it is permanently crowned; in other cases, you can have new (but temporary) teeth the same day your implants are placed. 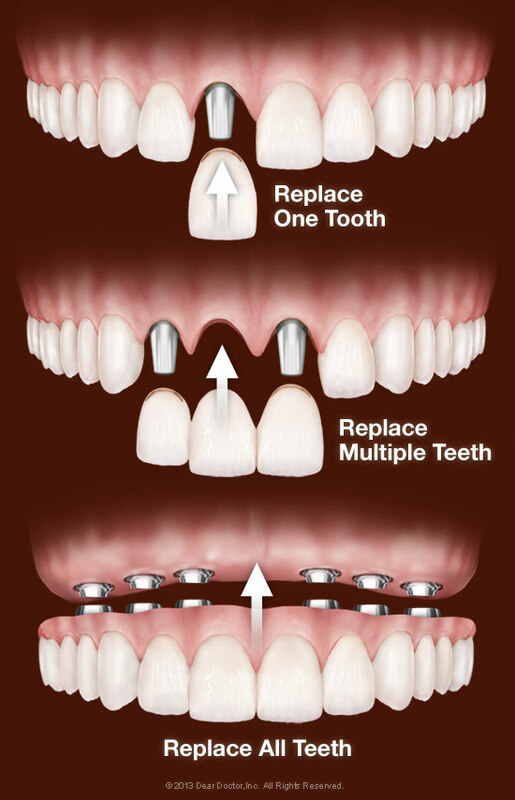 You can replace a single tooth, multiple teeth, or all your teeth with implants (View Examples). You don't even need one implant for every missing tooth. As few as two implants can support a removable lower denture, while as few as four implants can provide a full, permanent set of top or bottom teeth. At the outset, implants are more expensive than other tooth-replacement methods such as dentures or bridgework. However, they also last many years longer and should rarely need replacement. So they offer the best, most cost-effective option when viewed as a long-term investment in your health, comfort, and well-being. They require exactly the same care as natural teeth: daily brushing and flossing, along with regular dental checkups, and professional cleanings. Although implant teeth will never decay, the gum tissues around them can become inflamed or infected in the absence of good oral hygiene. Properly cared-for dental implants could last a lifetime. There's a good chance that you are, but this can only be determined after a complete oral examination that includes x-rays of your jaws by our family dentist and a local oral surgeon. Please schedule a consultation to begin the exciting process of restoring your smile and bite. For further questions or concerns, please consult our staff at West Gate Dental. We want to provide you with the most accurate information and ease any concerns you have. We will be more than happy to discuss your dental options for a missing tooth and see if a dental implant is the correct choice for you. Please call or stop by our office in Lincoln, Nebraska today! A beautiful, confident smile is right around the corner and we want to help you achieve it!